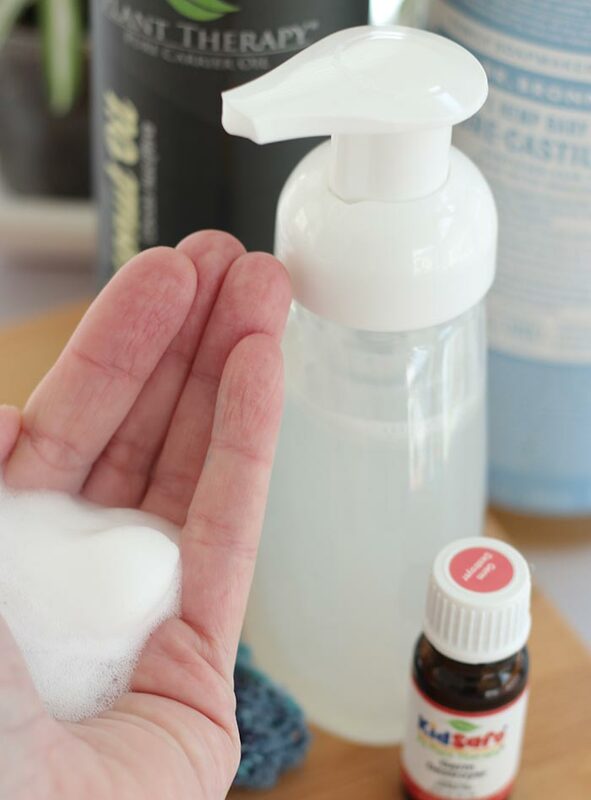 This homemade foaming soap with kid safe germ destroyer essential oil will keep your kids' hands clean all year long! I feel like I say this a million times a day. With two little boys it's a constant, especially during this particularly nasty flu season. I don't usually buy foaming hand soap, but my boys recently requested some of the "bubbly soap" that they use at preschool. I checked it out and discovered that foam soap is actually much easier for them to use! They love the texture, so they don't need to be reminded to use it, and it rinses more easily (they are sometimes way too busy to wait to get all the soap off). I've read before how easy it is to make your own foam soap, so I decided to give it a try. 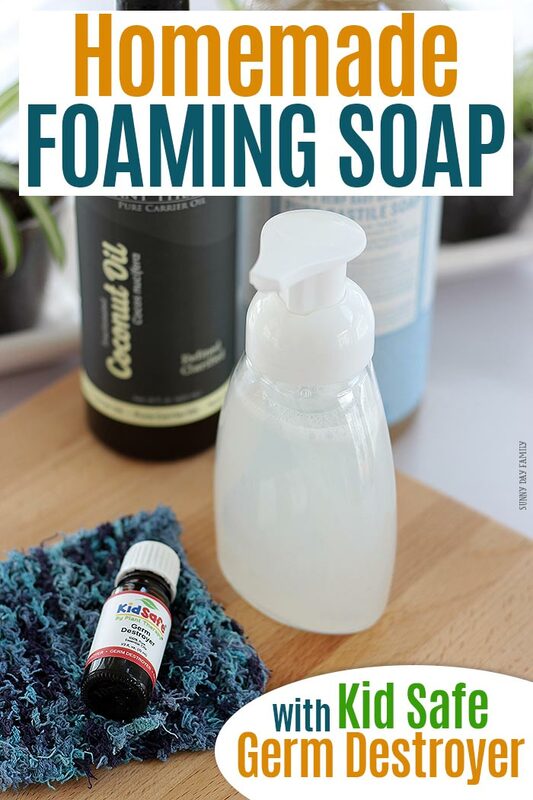 We are all loving this new homemade foaming soap recipe and it's super easy to make (and totally kid safe too!). Store bought foam hand soap can get expensive, plus it often contains a lot of chemicals. 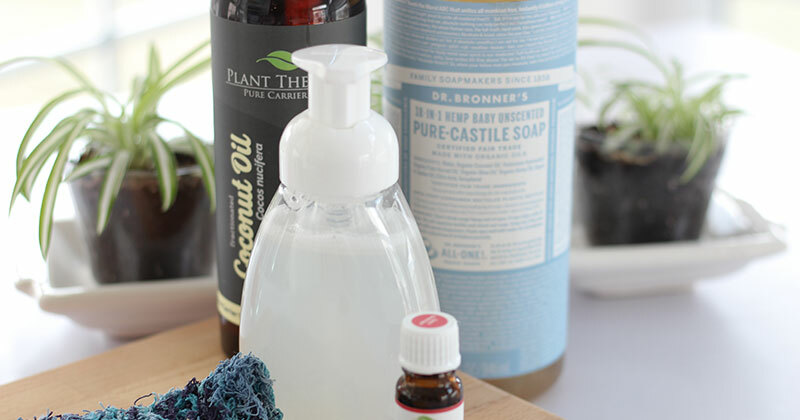 Making your own is so easy and you'll know exactly what you're putting on your family's skin. 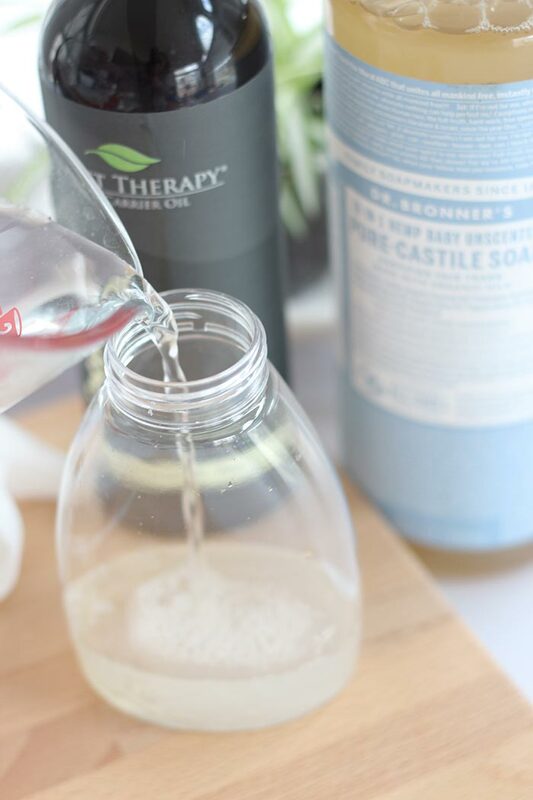 It takes just 5 minutes (if that) to make a bottle, and once you have all the supplies and ingredients on hand you'll find that a little goes a long way. I've made this soap for all our bathrooms and our kitchen, and everyone is loving it. Here's what you need to make your own. 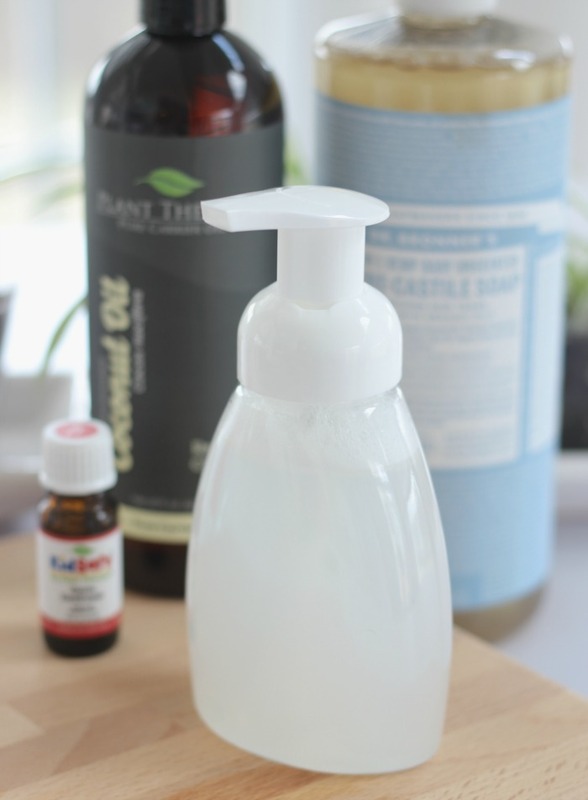 Add 2 tablespoons of Castile soap to a clean foaming soap dispenser bottle. 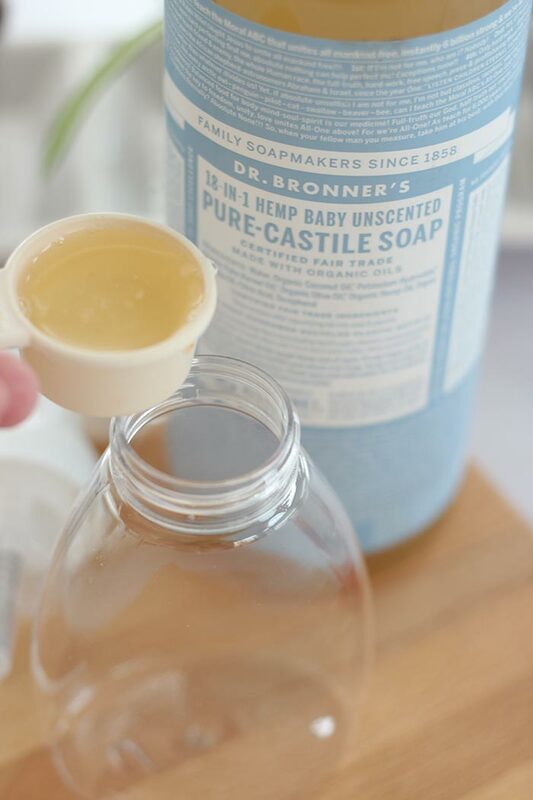 I like to use Dr. Bronner's baby unscented soap. It's a big bottle and super versatile, so one lasts forever. 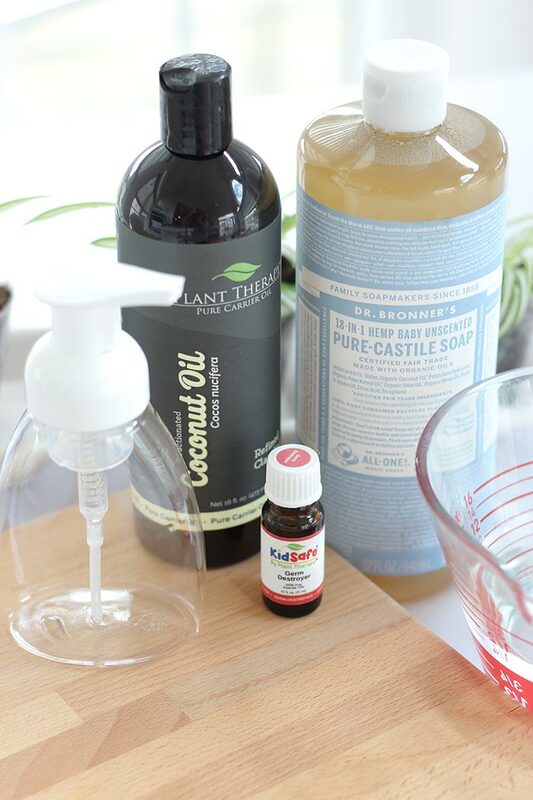 Add 1 teaspoon of fractionated coconut oil (this is what I use). This is the liquid type of coconut oil, not the solid. If you have another carrier oil that you prefer, like almond oil or sweet jojoba, that will work too. Next add 10-15 drops of Plant Therapy KidSafe Germ Destroyer Essential Oil. This has been my go to blend all winter. With a mix of Spruce, Marjoram, Lavender, Rosalina and Lemon, it smells amazing. 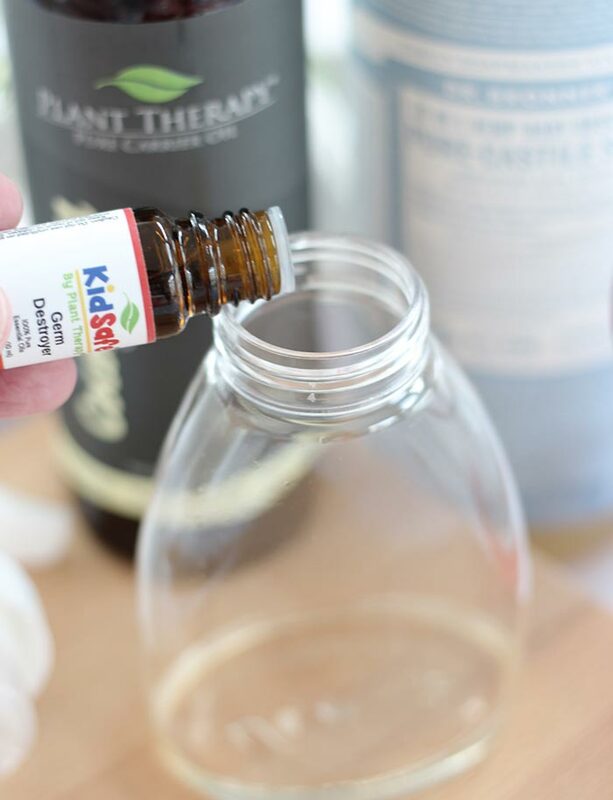 And since it's part of Plant Therapy's Kid Safe line, I know it's OK for my kids to use (but still just as effective for adults too!). Finally, add water to your dispenser bottle. Be sure to leave about 1/2 inch of space at the top for the foam. Close the top and shake gently to mix the ingredients. That's it! 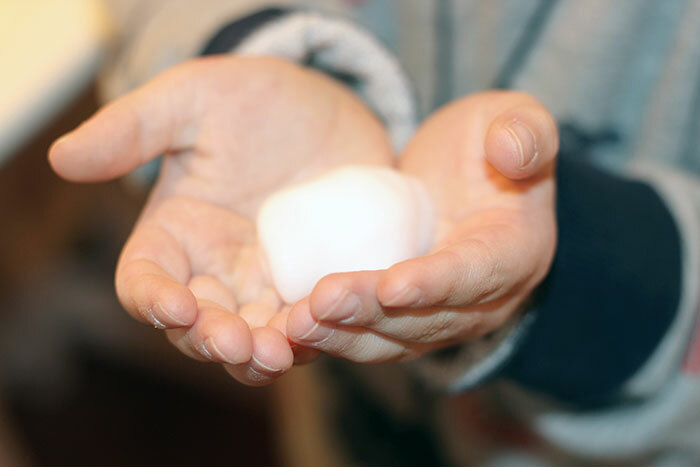 It makes a super refreshing foam soap that is safe for the entire family. It smells great and rinses clean. My kids love it! No more nagging about hand washing in this house - we're all happy to use our Germ Destroyer soap to keep our hands clean and the germs at bay. If you like this soap be sure to check out our 2 ingredient homemade deodorizer too! It's kid safe, dog safe, and has tons of uses to make your whole house fresh. See it here.